Picking flowers can be a radical act. My former husband would “forget” my birthday and other occasions, long before the formal divorce process began. About 10 years ago, a friend, who knew this about my then husband, asked me what I was going to do for my upcoming birthday. I said that I was going to “pick every rose in the garden, put them in vases, jars, and glasses, and fill the house with their beauty and scent.” My friend laughed with delight and approval. I did do just that. Since we had 1/4 acre, which I had turned into a great and lush garden with a variety of healthy rose bushes, the rose bouquets were bountiful and their mix of scents intoxicating. My husband came home from work and acted like he had not noticed the bounty of flowers. Nor did he acknowledge my birthday in any way. I was used to the man’s passive-aggressive behavior and knew from where it came. This was the man whose mother sent me birthday cards addressed to “MR. [HIS FULL NAME]’S (‘WIFE’)” just like that, all caps, quote marks, and parentheses. Like I did not have my own name, and as if I was his wife only by title, perhaps a sort of pretend wife. This because she was angry that I had taken back my own last name after seven years of using his. (My last name is awesome and I love it, while his is bland and never felt like mine.) The passive-aggressive ex-mother-in-law did this to goad me about my personal choice, an attempt to darken the anniversary of the day of my birth with her bitter cloud, but I had become immune to that, too. My policy was to immediately throw such envelopes in the trash, unopened. Picking all the flowers was, in a way, a radical act, a milestone. It meant that I had finally accepted the reality of my situation, and decided that I would be kind and generous to myself instead of waiting and hoping for crumbs from my husband. The lovely sprays of roses stood in defiance against what tried to demean and undermine me as a person. The following year, I did the same thing, picking all the roses, for the same reasons, and with the same non-response from the man I married. That fall, I signed a contract on a house of my own, leaped back into the workforce after 17 years of absence. I also convinced my husband to sign a separation agreement that included I would have sole physical custody of the kids, and my girls and I moved out. I called the 1970’s brick townhouse My Palace of Peace. The soil there was sandy clay loam, a gardener’s dream, and the perennial divisions I transplanted from the heavy clay at the marital home flourished. When my birthday came around, I picked some of every kind of flower blooming in my yard. There were Dutch iris from my dear friend Jill, hardy orchids from my cousin Elena, pink cabbage roses from my grandma’s garden, yellow evening primroses from my former neighbor Evelyn, crimson mini-roses from my old friend Barb, lavender mallows I had grown from seed, and sprigs of lavender from “My Little Provence,” a row of lavender shrubs I had planted in the back yard. It felt decadent and rewarding to pick all of them, to give them to myself, and recognize that they had grown thanks to my own hand. Adding to that richness was that these had grown in my own place, My Palace of Peace, that I established for the benefit of my children, a reasonably quiet and safe place to finish raising them. I raised kids, flowers, and food at My Palace of Peace for eight years, and in that time I became practiced at meeting my own needs, fulfilling my own desires, and making myself happy. Last September, I sold the house because it had served its purpose and I no longer needed it. Though I had given away many plants and divisions, the yard was still rich with flowers for the new family to enjoy. I wish them the ability to create their own kind of beauty and love in their home. This is my first year without a garden of some kind since I was a teen. Being a nomad has its disadvantages. 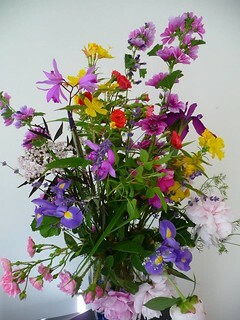 Without a garden, I could not cut flowers for myself this year. I miss my garden, so on my birthday I spent some time in the garden of my dear friend, who is hosting me for a while as I play landlubber between sailing gigs. My friend is a teacher, with a busy life and three boys at home, but still made time to stop on her way from work, so she could bring me a lovely bouquet of flowers. Gail didn’t know the story I wrote here, but she knew I would love the alstromeria. I do. They mean more than she can know. This entry was posted in Fun & Magic, Kindness and tagged Community, Fun & Magic, Giving & Receiving, Happiness, Kindness, Love, personal growth, Resilience. Bookmark the permalink. I am so so happy you’re putting your roots into what makes you grow wildly and bloom beautifully. Ultimately the gardens we tend are ourselves. Laura, thank you for your thoughtful comment. Your garden analogy is lovely, and I will remember it.